Summer is looming, so what does this mean? The perfect season to wash your car is just around the corner. What better way to enjoy the sun than by cleaning your car? After all, you don’t just get a sparkling car, but a dose of vitamin D too! Follow our step-by-step guide and you’ll be on track to cleaning your car like a professional, without having to pay the price for it! Whilst you may think it’s a good idea to park your car directly in the sunlight (and of course, it’s tempting to get a tan whilst in the process of washing), it’s best to park your car in the shade. This will help prevent premature drying which can result in water spots – not a good look! The last thing you want is to hose down your car and then realise that your windows are open. Car seats take ages to dry, so if this does happen, you’ll be waiting a long time before you can drive anywhere. Avoid this drama by ensuring that all windows are closed tight. Remember to always pull the windscreen wipers away from the windscreen, until they click into their propped position, away from the glass. Failure to do so could result in damaging your wipers. Some people just get to it with the soap and water. However, there are bound to be marks on your car, so it’s important to pre-wash these sections, just like you would with an item of clothing that has stains! Soften dirt and other marks by hosing off the car, but be sure not to use a strong jet as this can rub grit over the paint and scratch it. Always remember to aim the jet downwards as aiming it upwards may result in water dribbling into the car if the rubber seals aren’t airtight. Soak Your Sponge in Soapy Water and Wash! And don’t just use any soap, use soap that’s designed specifically for car washing. Other soaps and detergents may damage your car’s paint or strip the wax off it, so it’s important to use car-friendly products. When washing, it’s best to do it section by section, starting at the top; this will make it easier for you to know which parts you’ve washed! Regularly rinse the dirt out of the sponge as you go along and circle around the car several times to ensure that you remove as much dirt as possible. 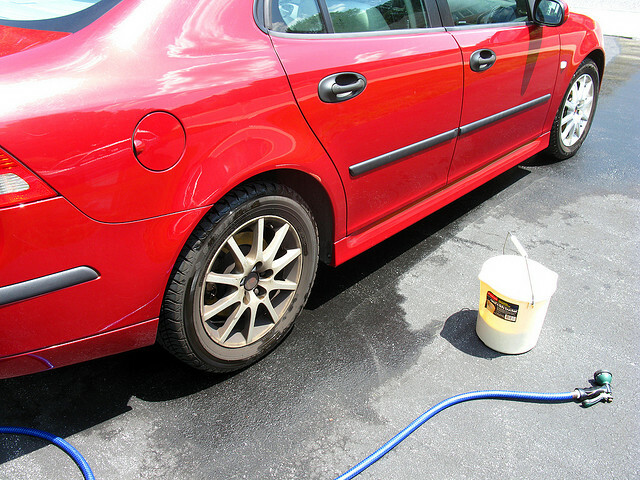 Give your car a thorough rinse with the hose to ensure all the soap is off. If you miss a spot, the soap will dry on the paint and stain it. Dry your car down with a microfiber towel to avoid a patchy effect that will result if you leave the sun to do the drying for you. Now you can sit back, relax and admire your clean car! Road trip, anyone? You’ll no doubt want to show off your shining beauty. So, now you know how to successfully clean your car, but do you know how to maintain your car? If not, click here for some trusty tips. And if you’re interested in jazzing up your car with a personal number plate, here at Primo Registrations we have just what you’re looking for.